Since January 1997 Turner Classic Movies has published Now Playing, the channel's programming guide and magazine devoted to classic film. Over the past twenty years Now Playing has offered its readers articles, behind-the-scene looks at TCM, rarely seen photos of classic movie stars, and much more. Sadly, TCM is ceasing printing Now Playing. Its last print issue will be August 2017. Subscribers will receive a pro-rated refund based on the remaining balance of their subscriptions starting in July. The print version of Now Playing is going to be replaced by a digital version of the magazine that one can receive through email. The good news about the digital version is that it will be entirely, totally free. The digital version of Now Playing will include a printable schedule, articles, photos, and so on. If you wish to subscribe to the digital version of Now Playing, you can do so here. As sad as it may be, in some respects it is understandable why Turner Classic Movies is bringing the printed version of the Now Playing guide to an end. The past twenty years have not been kind to print media. Since the Nineties several major magazines have ceased publication, including Amazing Stories, Cinefantastique, Ladies Home Journal, McCall's, and The National Lampoon, among many others. Even given the enthusiasm of TCM fans for anything related to Turner Classic Movies, it seems possible that Now Playing fell victim to the same falling sales as many other print magazines. While the end of the print version of Now Playing is certainly the end of an era, at least there will be a digital version to take its place. Many of us might well prefer a print version, but at least we will still have something to look forward to and read each month. Clifton James, who played Sheriff J. W. Pepper in the James Bond movies Live and Let Die (1973) and The Man With the Golden Gun (1974), died on April 15 2017 at the age of 96. He also appeared in such films as Cool Hand Luke (1967) and Will Penny (1967). Clifton James was born on May 29 1920 in Spokane, Washington. At the start of the Great Depression his family movie to Gladstone, Oregon. In the Thirties he worked in the Civilian Conservation Corps. During World War II he served in the United States Army. He earned the Silver Star, Bronze Star, and two Purple Hearts. Following the war he took classes at the University of Oregon, where he acted in plays. He then moved to New York to pursue a career in acting. Mr. James made his television debut on the soap opera The Secret Storm in 1954. He made his Broadway debut in The Time of Your Life in 1955. In 1957 he made his film debut in The Strange One. In the Fifties Clifton James guest starred on such shows as The Phil Silvers Show, Kraft Theatre, Decoy, and Naked City. He appeared in the film The Last Mile (1959). On Broadway he appeared in The Cave Dwellers, J.B., and The Long Dream. During the Sixties he appeared in such films as Something Wild (1961), Experiment in Terror (1962), David and Lisa (1962), Black Like Me (1964), Invitation to a Gunfighter (1964), The Chase (1966), The Happening (1967), Cool Hand Luke (1967), Will Penny (1967), The Reivers (1969), and WUSA (1969). He guest starred on such TV shows as Naked City, Route 66, East Side/West Side, The Virginian, Mannix, Ironside, Gunsmoke, and Bonanza. He appeared on Broadway in All the Way Home, Great Day in the Morning, Andorra, And Things That Go Bump in the Night, and The Trial of Lee Harvey Oswald. 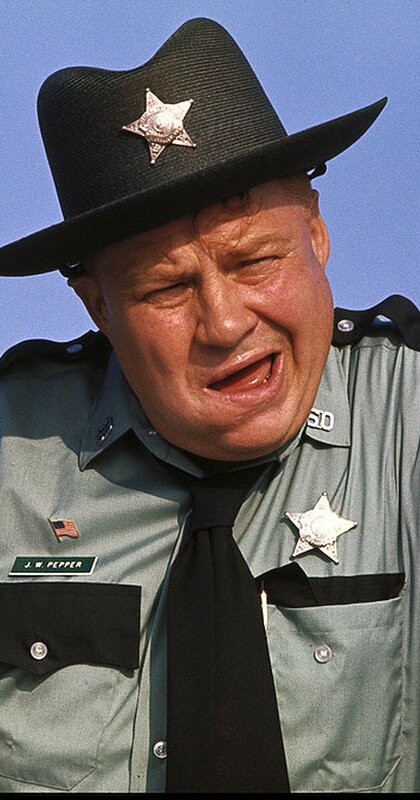 In the Seventies Clifton James appeared in such films as The Biscuit Eater (1972), The New Centurions (1972), Live and Let Die (1973), The Iceman Cometh (1973), Bank Shot (1974), The Man with the Golden Gun (1974), Rancho Deluxe (1975), Silver Streak (1976), and Superman II (1980). He guest starred on such shows as The Six Million Dollar Man, City of Angels, Hart To Hart, Young Maverick, Quincy M.E., and Another World. He appeared on Broadway in The Shadow Box. In the Eighties Mr. James was a regular on the TV show Texas and Lewis & Clark. He guest starred on such shows as The Fall Guy; Trapper John M.D. ; The A-Team; Murder, She Wrote; Dallas; and Night Court. He appeared in such films as Talk to Me (1984), Stiffs (1985), The Untouchables (1987), Eight Men Out (1988), and The Bonfire of the Vanities (1990). He appeared on Broadway in Total Abandon. In the Nineties and Naughts, Clifton James guest starred on such shows as Monsters, Gabriel's Fire, and All My Children. He appeared in the films Lone Star (1996), Interstate 84 (2000), Sunshine State (2002), and Raising Flagg (2006). Clifton James was very good at playing Southern caricatures. Sheriff J. W. Pepper remains one of the high points of Live and Let Die, even getting one of the movie's best lines. That having been said, it would be a mistake to think that he could only play caricatures of Southerners. In Eight Man Out he played Charles Comiskey, the owner of the scandal-ridden Boston Red Sox. He also played the prosecuting attorney who handles the Al Capone case in The Untouchables. He also had a highly successful career on Broadway, where he played wide variety of parts. Although best known for playing Southerners, he played many other sorts of roles during his career. First up is Felicia Farr, who is painting eggs! Next Ina Mae Spivey (later Mrs. Gene Autry), who is also painting eggs. 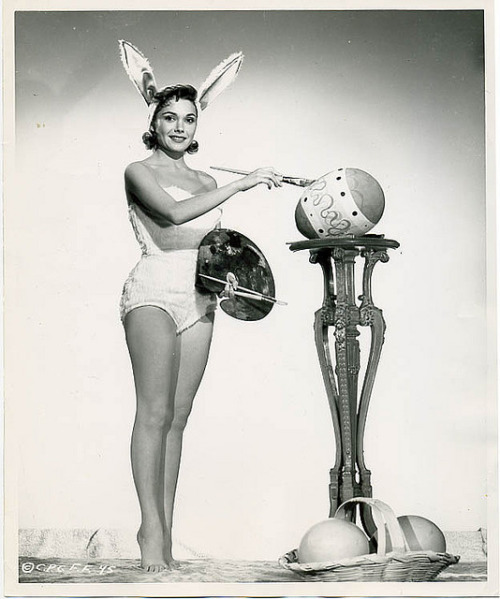 Vera Ellen is receiving eggs from the Easter Bunny! 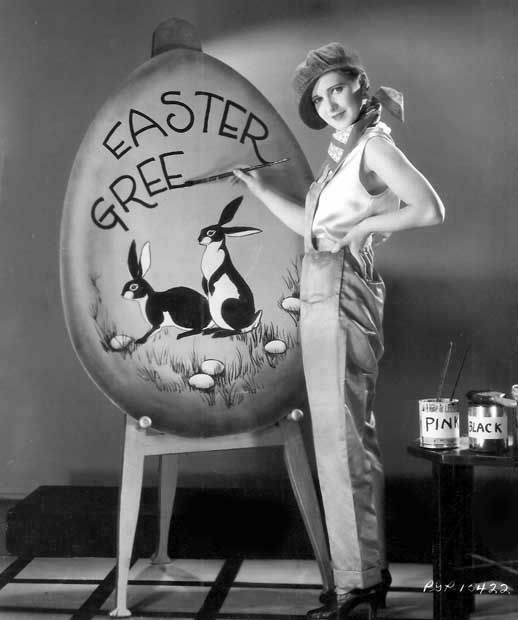 Jean Arthur is painting an Easter sign. 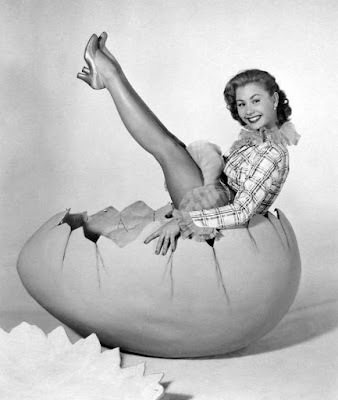 Mitzi Gaynor is hatching from an egg! 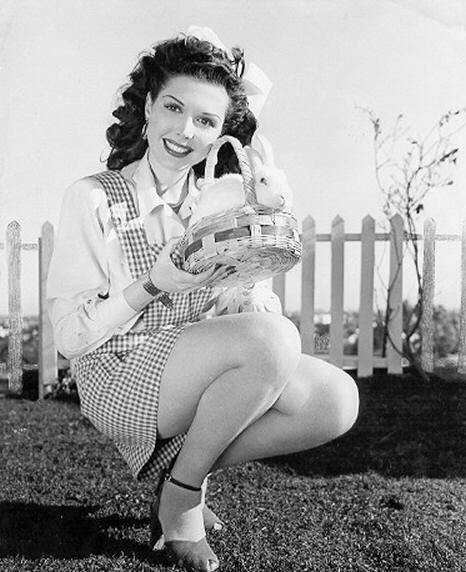 And last, but not least is Ann Miller with an Easter Bunny!